A while back an friend and I were talking about programming. They’d recently taken it up in the job he was doing and were relatively fresh to the discipline. 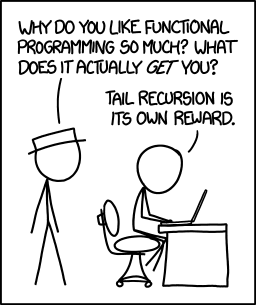 Asking for a code review from a collegue, they’d been told that their Python was pretty good but that it could do with breaking out into smaller functions. My friend couldn’t see the point of this - the code worked, it did the job, what’s the problem? I had a crack at explaining why. Didn’t do very well. More recently I was getting some feedback for something small I’d written. It was, of course, awesome - like all the code I write.1 They said they liked it, but the modularity wasn’t entirely necessary because the individual modular parts wouldn’t be reused. When I say ‘modular’, I mean small and isolated and independent. A class that’s a few lines long, the one line method in Ruby, the short function. At a larger level I mean, well, larger small things. A file with one class in it, or one function in it. Maybe I mean microservices. Maybe not. What sort of tests do you love? When there are hundreds of them - which ones make you happy inside? In my (admittedly limited) experience, it tends to be the ones that run really quickly and don’t randomly fail. Sure, the ones that exercise the whole system are nice and necessary, but the ones that make me smirk a little are the unit tests that whizz by in the blink of an eye. And in order to have those fast little tests, you need small little bits of code to test. TDD makes us write the tests first - and the easiest tests to write are the ones that cover single, simple ideas that you want to implement. TDD wants us to write small tests that consequently should lead us to write small pieces of code. Performing TDD produces code with tests - this is a given. But I find that people celebrate this more that what I think the bigger prize is: you have been forced into writing your code modularly, bringing with it other and possibly greater advantages. This is probably the most important one. If your code is small and independent, then there is a much higher chance of you and everyone else understanding what it does. If a single function / class / method is longer than a screen, I would go so far as to say that it’s near impossible to understand what it does. If you’re programming in small, easy to comprehend3 parts, then there is more chance that you’ll be understood - if only because you’ll have had to give them names. Possibly bad names, but names all the same. Names you’ll be able to read and know what they mean and so what the parts do. Or at the worst, names that you read, don’t understand, and then read the code, understand that because it’s short, and then rename it with something (hopefully) better. Yes, reuse is good - it’s a good benefit of small pieces of code. You write that Fibonacci function, you can use it everywhere that you need a Fibonacci number. It is part of the wonderful magic of small, independent things. Whether you do reuse a part of code is often by the by - it can often come later on when you have a better idea about the thing that you’re trying to build. Look, if you’ve heard this before then you probably have - hell, I just worked out what I was talking about when I got to the end of writing it. It’s basically the first two bulletpoints of the Unix philosophy - do one thing well, and integrate with other programs. But as we’re not writing programs - we’re just writing parts of programs - we don’t have to worry about the requirement for generalization (that can come later if at all). That integration is eased internally if we make the modules truely independent of each other. Like Lego blocks - some are small and general (think a 3x4 flat piece), or small and specific (think a laser gun), but they’re all small and easy to integrate with each other. Barely anything is its own reward. Maybe pizza. From the Latin com together, and prehendere grasp. It’s literally easier to hold stuff together when it’s small.